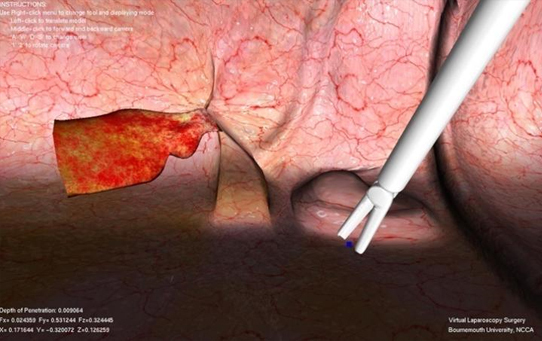 Development of a Laparoscopic Surgical Training System with Simulation Open Framework Architecture (SOFA). We have developed a physics engine which can be easily used and extended to develop other kinds of surgery simulation. To train trainee laparoscopic surgeons, methods such as relying on animals and cadavers usually cause ethical and moral issues and are expensive. Performing surgery under the supervision of experienced surgeons becomes a practical solution in many scenarios. However it will involve a long learning curve to gain adequate experience to become a qualified surgeon. Our haptic based virtual training system can provide trainee surgeons effective training before applying them to real patients. Through using our system, trainee surgeons can gain vital experience quickly and safely.